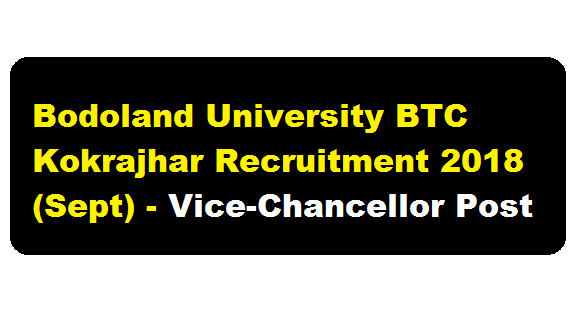 Bodoland University BTC Kokrajhar Recruitment 2018 (September) : Vice-Chancellor Vacancy :- Bodoland University was established in 2009 at Debargaon, Rangalikhata. Kokrajhar. It is developing into a centre of Quality Education and Research over 500 Bighas of green Space. Recently , Bodoland University has published a vacancy Notification in September 2018. According to the Latest Bodoland University Recruitment 2018 September, the University is inviting nominations/ applications for the post of Vice-Chancellor. The details of the recruitment can be found below. In this section, we will discuss in details about the recruitment of VC Post under Bodoland University Recruitment 2018 September with vacancy details, eligibility criteria, salary with other details and requirement. Experience : Minimum experience of 10 years as Professor or equivalent.